Forum Index > Historical Arms Talk > Roman Spatha: Timeframe and use? Posted: Fri 13 Jan, 2006 10:17 am Post subject: Roman Spatha: Timeframe and use? My question is In what timeframe do evidence of the spatha come? What Archelogical finds and references in conteporary material is there of who used them and how where they used? Why I ask is because after reading alot I am confused, some sources say it is a cavalery weapon though other say it was also used by unmounted Auxiliae of the Roman forces. Would be greatful for some straighting out on the subject. BTW, Peter, how is the NG Spathas coming on? I espere to help you. I know the subject rather well but I speak badly English. If I am confused, don't hesitate with me the statement! Laloë pretty much summed it up. Spathae were used by the "barbarians" that Rome fought. The Romans adopted it as a cavalry weapon, and eventually (about 4-5 century AD) it became an infantry weapon as well. Many spathae and Migration era swords are very similar, and have been found in bogs together, so they certainly influenced (and maybe even carried over into) the migration era swords. Peter Connolly's Greece and Rome at War actually has quite a bit of info on spathae, but most books dealing with Imperial Roman Auxiliaries should have at least something. It is hard to actually define what a spatha is. Today the word is used for any Roman sword that is longer than a gladius. The term is so general as to be meaningless. also the complete roman army by Adrian Goldsworthy is one to pick up. That is one of those own-it-haven't-read-it books. It's sitting about two feet from me, and I have used it as a reference a few times, but as far as just picking it up and reading it so that I know the info, yeah... that hasn't happened yet. anybody have any more info on this? was it exclusively a cutting weapon and if not, how effective was it to thrust? what were its shortcomings? The question cannot be answered until you clarify why you mean by "spatha". The word is used to describe any sword the Romans used that was longer than a gladius. Some were very good thrusters. Others only cutters. Some were cavalry weapons. Others infantry blades. if not, could you link to descriptions/pics of the this thrusting spatha please? and was the cavalry spatha an effective thrusting weapon? what's the difference between the cavalry spatha and the thrusting spatha? How long was a Gladius? How long is a piece of string?!! The term Gladius is in itself meaningless unless you define it. It is simply Latin for sword and thats probably how the Romans would have described any sword regardless of its length. Modern labels applied to ancient weapons are always going to be broad, and to an extent, ill-fitting, because they have been applied retrospectively; The Romans never made their swords to a set criteria of short gladius and longer Spatha. However, it doesn't mean that they are completely meaningless. It just means that they must be taken only as a general guide. As to books, I would also recommend another of Goldsworthy's works, The Roman Army At War 100BC-AD200. Its a much more academic work than Complete Roman Army but its a very good read and I would advise anyone who has an interest in the Roman army to give it a look. Same problem in the Renaissance or later. If you asked an Italian in the 16th century what a "Spada" was he would of meant a sword. Other languages have the same issue throughout history. So you would probably have to attach an adjective to the noun to get a better description in any language you use, such as "Long Sword". We find the word "spatha" for the first time in Tacitus (I AD), talking about roman auxiliaries: "et si auxiliaribus resisterent, gladiis ac pilis legionariorum, si huc verterent, spathis et hastis auxiliarium sternebantur"
Thus spatha (in sources) appeared for the first time in the hand of german cavalry auxiliaris during the invasion of Britain. We are sure that the word "spatha" indicates a different kind from gladius and other kind of swords (like spanish falcata,kopis ecc..) because romans used the word "ensis" (ensis falcatus ecc..) for every other sword. So spatha was probably a genuine new type. While Gladius was 40-55 cm long (depends on gladius kind and fabrica that produced it). Spatha was over 75 cm long, taking from gladius the same, simple cross guard, and the straight, double-edged blade. It was a cavarly weapon, but was largely adopted by infantry around IV century. All germans people, during migration period, adopted similar kind of spatha. Those of Longbard are particularly wonderful, sometime covered in gold and pattern-welded. Other people like Heruls had spatha closer to roman model. THe best estimate that I can find from reading is that what we call the spatha was adopted by the Romans about the same time that they began to hire Gallic and Germanics mercenaries as cavalry. Since the native sword for these peoples was a longer slashing sword, they brought it with them to use and the Romans quickly discovered that it was much better for use from a horse than their shorter swords. Therefore, they adopted it as they adopted so much else. It was sometime during the very late 1st Century BCE that they began to hire these Gallic and Germanic cavalry, so I would date the adoption of the spatha to that period. Later, during the 3rd Century CE, the spatha began to replace the shortsword as an infantry weapon during the period of the chaos of the mid-Third Century. I suspect, but I cannot prove, that the replacement of the shortsword reflects the growing barbarization of the Army as it become more and more staffed by Germanics. THe best estimate that I can find from reading is that what we call the spatha was adopted by the Romans about the same time that they began to hire Gallic and Germanics mercenaries as cavalry. .
the tomb of whom? i can't find any reference to Vonatrix - in fact i can't even find that word used at all anywhere on google. Can anyone tell me more about the techniques used when fighting with a spatha (for you sticklers we'll say with a longer spatha like the one above or the one i'm posting below)? how would one be wielded in hand to hand combat? say in single combat. how would it be wielded from a horse? or in a shield wall? if the longer spatha eventually replaced the gladius i'm assuming it was used in both the shield wall and horseback, and therefore must be an effective thrust and cut weapon. I don't think it would have been too different from other weapons made for a similar purpose. On horseback you'd be using it mostly when caught unawares or when pursuing your enemies, while on foot...well, it seems to have been a decent thrusting weapon so its method of use wouldn't have been that different from the gladius either--only that now you could reach longer. And when your enemies turn their backs and run, you'd have a better chance of having your swing go far enough to hit their backs or their legs. Caesar began to hire gallic and germanic mercenaries and they brought their own equipment to the roman army. He even went so far to describe the gallic cavalry superior to his own roman cavalry at certain occasions and admired the combined use of rider and footsoldier by the germanic troops. The spatha is essentially the celtic late Latene-longsword, that was also used by the better equipped members of germanic tribes. 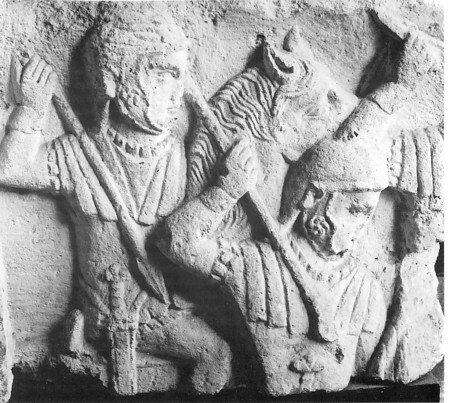 One of the striking evidences for this is a piece from a roman relief from Arlon in Luxemburg from around 50 AD. Their spathae still have celtic grips, in contrast to the round pommel used on gladii. Attacking roman riders on the relief of Arlon. They wear mail armor combined with segmented shoulder defences instead of the usual mail defences and spathae with three lobed pommels.